Let me start by saying that this will be a joint review between Kate and I. We have each done a review with Anne but not one together. I’m super excited about it! We’ll each give our reviews, a list of our faves of the series and our not so much faves. I hope you enjoy the review as much as we enjoyed the book and writing it. The King Of Hearts is about Cam McKay who is the deputy of this hometown since his discharge from the armed services. He was badly wounded and ended up with part of one leg and hand amputated. On Valentine’s Day there is a murder suicide committed and he is on the scene. It was very disturbing because of the nature and brutality of the crime. It also talked about PTSD and getting treatment for it. It was okay for me but a little preachy about gun control. I did enjoy his scenes with the kiddos. Rough Road was about Trevor, Edgard and Chassie Glazner. They are a committed triad. If you are unfamiliar with that, it means they are all lovers in a committed relationship. They all have children together and raise them together. This story deals with prejudice against their lifestyle involving their son. He’s bullied by a child at school and he questions his parents about what the “F” words means. I do want to point out that the parents of the bully were worst case opinion people. Not every one who disagrees with someone’s lifestyle is a jerk about it. I loved the support they got from their extended family and the lovely vacation they got to take. All Knocked Up is about Jack and Keely Donohue who are awaiting the arrival of baby number one. Between work schedules and pregnancy hormones it’s a wild ride. The bonus to this story is that we get multiple babies! I enjoyed all three stories and can’t wait for the next installment in this wonderful series. Don’t get me wrong, I liked them all but some more than others. Now, on to Kate. What does a series that already has 14 full length books (#15 is slated to be released on 6/18) and 2 novellas need? *waiving hand in the air* OOH, ooh, pick me. I know. An anthology containing a short story and two novellas! All Knocked Up follows Jack and Keely through the end of her first pregnancy. This one made me laugh out loud. B, inferno. For those of us waiting for the next installment in the Rough Riders series these stories will help fill the void and pass the time. I’m curious to find out how many of you are riding the Rough Riders train? What was your favorite book so far? I’ve not listed them before and it was funny because some of them I actually felt my lip curl just reading the title. And Kissin’ Tell would have been a few spots lower on the list except for Lorelei James’ masterful use of a trampoline 🙂 Makes me smile every time I think about it. I’m curious to know what your favorites are. Beware there are spoilers below! Blay and Qhuinn? Where do I start? I loved it! I just loved it! 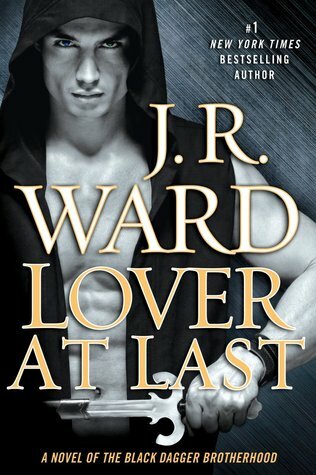 Okay, first off, I am so glad J.R. Ward finally brought them together. We have all waited forever. The relationship has been painful to watch over the years. My heart has always went out to Blay and in the last two books, Qhuinn. Before that, Qhuinn was kind of an asshat. I know he was in denial but come on! Watching their love unfold in this novel was beautiful. I couldn’t be anymore happy. The fight for the throne? Yikes, I’m kind of scared about this one. It should be very interesting how this unfolds. Wrath and Beth? A baby? I hope so. Wrath handling the glymera? Loved it! Qhuinn’s brother? Hmm? We’ll have to see about him. I’m still mad at him for his previous treatment of his brother. Xcor and Layla? Wow! I can not freaking wait for their story! Trez and Iam? Oh, please, please, please. Now! Saxton, what’s he up to? I really like him. I wonder if he’s gonna upset me. Qhuinn and Layla? What a wonderful relationship! I’m glad Qhuinn has an actual female friend. An induction into the Brotherhood? Qhuinn? What about John Matthew and Blay? I had three big problems with this book though. One was Blay’s dishonesty with Qhuinn about the end of his relationship with Saxton. Two was Qhuinn being okay with what he thought was cheating with Blay against Saxton. And three, Assail, in general. Don’t like his character. I hope I will learn to like him like I did Rev. This was a great read and I can not wait for the next book! I wish the next book was Xcor and Layla but no, it’s Wrath and Beth. Oh well!